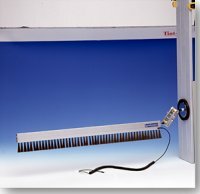 The Kinetronics StaticWisk© anti-static graphics brushes dissipate static electric charges on materials and improve production speed in manufacturing. StaticWisk brushes are also used to reduce the static that attracts dust and lint. The StaticWisk graphics brushes are made from conductive synthetic fibers. The ultra-soft fibers are 1 5/8″ / 40mm long, and are mounted into a special extrusion that holds the brush in place. Each brush is furnished with a coiled grounding cord. A unique magnetic mounting system is150mm (6″) long and uses a double ball joint for quick, easy mounting on printing, folding, packaging and manufacturing equipment. To order, speak with a Sales Specialist at 1-800-624-3204 (U.S. and Canada) or 941-951-2432.